Dwarf galaxies are, as the name implies, small or even tiny galaxies with much lower mass and luminosity than large galaxies such as our own Milky Way galaxy or the Andromeda galaxy or Triangulum galaxy. The first two galaxies are the dominant members of our Local Group of galaxies, which has over 50 members. While the Milky Way and Andromeda have over 200 billion stars each, most all of the others are much smaller and intrinsically fainter, and thus are considered dwarf galaxies. Around half of these known dwarf galaxies are companions to our Milky Way, and the rest are companions of Andromeda. 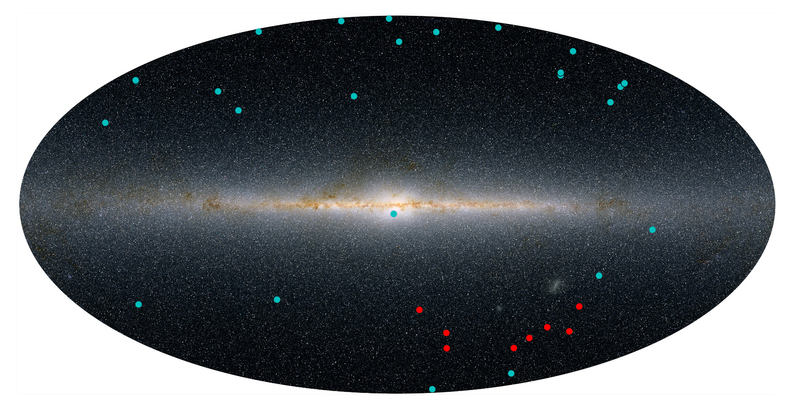 Previously known dwarf satellite galaxies around our Milky Way galaxy are shown as blue dots and the 9 new candidates are shown as red dots. Image: Yao-Yuan Mao, Ralf Kaehler, Risa Wechsler (KIPAC/SLAC). The Dark Energy Survey “powered up” in the second half of 2013. Using the Dark Energy Camera at the Cerro Tololo Inter-American observatory in Chile, two teams of astronomers have now made a stunning discovery of 9 new dwarf objects in the vicinity of, and gravitationally bound to, our own Milky Way. Three of these are confirmed to be dwarf galaxies. The other six objects are either dwarf galaxies or globular clusters, and further observations will be required to determine how many of these are indeed dwarf galaxies. These new dwarf galaxies and dwarf galaxy candidates were found in the vicinity of the Magellanic Clouds, in the Southern Hemisphere. Those are themselves the two best known of all dwarf galaxies, but are substantially brighter and larger than these new dwarf galaxy candidates. 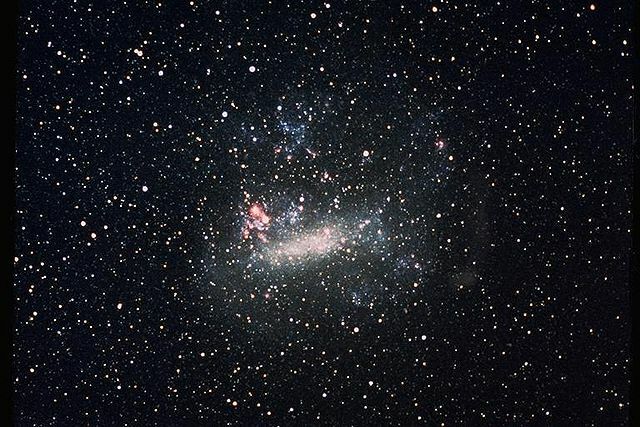 In fact it is possible, but not certain, that the newly discovered dwarf galaxies have interacted with one or both of the Magellanic Clouds in the past. This discovery of 3 or more new dwarf galaxies near to our Milky Way, in the range of about 100,000 light-years to 1.2 million light-years away from us, has important implications for our understanding of dark matter and cosmology generally. We know from a wide range of observations, including the latest Planck satellite results, that dark matter is 5 times more common than ordinary matter in the universe. Dark matter and ordinary matter are distributed differently. Think of dark matter as the scaffolding which controls the overall distribution of matter at large scale. Ordinary matter is thus controlled gravitationally by the dark matter background. But ordinary matter also clumps together at smaller scales because as it collapses (falls into a gravitational potential well) it heats up via frictional processes. Next it radiates away energy, leading to cooling, and thus further collapse. This is how we end up with galaxies and stellar formation. Large galaxies will be dominated by ordinary matter toward their centers, but by dark matter in their outer regions and halos. Many dwarf galaxies appear to have few stars, as little as only a few thousand, reflecting quite modest amounts of ordinary matter. These galaxies are heavily dominated by dark matter, sometimes 99% or more. There is a whole theory of galaxy formation based on the growth of dark matter-dominated density perturbations that collapse under their own gravity, even while the universe as a whole is expanding. Ordinary matter is pulled into the regions of high dark matter density, leading to galaxy formation. Low density regions do not collapse, but keep on expanding in,the “Hubble flow”. Numerical simulations of the growth of these dark matter density perturbations and of galaxy formation suggest there should be large numbers of dwarf galaxies. As we continue to discover more dwarf galaxies in the vicinity of our Milky Way, through the Dark Energy Survey and other experiments, our confidence in our understanding of cosmology and of galactic formation and evolution will continue to grow. Mass estimates for our Milky Way vary widely, from less than 1 trillion, to as high as 4 trillion, times the mass of the Sun. A recent paper by a group of astronomers in Australia argues for a mass that is very much at the low end of this range. Prajawal Kafle and collaborators present a kinematic analysis and build a model of the Milky Way that incorporates a disk, a bulge, and a dark matter halo. The analysis utilizes K giant and horizontal branch star catalogs. The disk component – in which our Sun resides – contains stars and gas and active star formation from this gas. The spheroidal bulge contains the oldest stellar population of the galaxy, including globular clusters. The spherical halo, significantly larger and more massive than both the other components, is dominated by dark matter. It is chiefly responsible for the overall gravitational potential of the Milky Way, and is evidenced by the high rotational velocity of our galaxy in its outer regions. The relatively low mass they determine for the dark matter halo implies fewer satellite galaxies in close proximity to the Milky Way. We see only 3, the two Magellanic Clouds and the Sagittarius Dwarf Galaxy. In the past this has been seen as an issue for the favored Lambda – Cold Dark Matter (ΛCDM) Cosmology. However their lower halo mass is actually consistent with the Milky Way gathering only 3 so-called sub-halos (satellite galaxies) and thus there may be no Missing Satellite Problem with ΛCDM. Some had suggested warm dark matter, rather than cold dark matter, may be necessary because of the putative missing satellite problem, but this may not be the case, with a lighter Milky Way dark matter halo. Another team, Penarrubia and collaborators, has recently modeled the dynamics of the Local Group of galaxies. They are thus using a different methodology to determine the total mass of the Milky Way. They find a total mass for the Local Group of 2.3 trillion solar masses. The Local Group mass is almost entirely due to the Andromeda Galaxy and our Milky Way. They also determine a Milky Way to Amdromeda mass ratio of about 1/2. This implies a mass of about 0.8 trillion solar masses for our Milky Way, consistent with the Australian team’s result. These two latest measurements of the Milky Way mass seem to indicate that the total mass of the Milky Way galaxy is less than 1 trillion solar masses. And these two results thus suggest that the ΛCDM cosmology is in fact consistent with the small number of satellite galaxies around our Milky Way. Another success for ΛCDM, it seems.